Boxing Champ Errol Spence Jr. Is So Dallas. On Saturday Night, Under The Gaze Of Showtime‘s Cameras, The Undefeated Welterweight Became The Undisputed Champion Of Dallas Culture. It was never really a question of if Errol Spence Jr. would win his title defense fight against Mexico’s Carlos Ocampo on Saturday. Nope. Even though Ocampo (like Spence) was undefeated heading into the Showtime-broadcast, Frisco-set bout, it was always a matter of when the 28-year-old from DeSoto — currently ranked the fourth-best pound-for-pound boxer in the world — would dispatch of his latest challenger. The answer? Not very long at all, turn out. In the waning seconds of the very first round, Spence knocked Ocampo out with a body blow. That’s right, a body blow. The knockout was the 21st in Spence’s increasingly storied, 24-0 career. But, honestly, that’s not the story of this fight. Rather, this is: Given that this fight was hosted in the Dallas area — something Spence has been teasing since 2017’s Mayweather-McGregor fight — Spence took every opportunity to show off his hometown pride for Showtime viewers on Saturday. And it was a beautiful thing to see. Let’s take a bullet-point look at all the ways Saturday night’s fight was as much a showcase for Dallas as it was for Spence. • It was the highest-profile event yet hosted the Ford Center, the crown jewel of the Dallas Cowboys’ The Star complex in the North Dallas suburb of Frisco. Spence has previously helped break in impressive new venues in the Dallas area with fights, but this effort — his first hometown bout since earning the title of IBF Welterweight Champion in May 2017 — was no doubt a bigger deal than those past ones. And it was a smart move on the part of both “The Truth” (that’s Spence’s in-ring nicknames) and Dallas Cowboys owner Jerry Jones to host this card at the Ford Center, indeed: Beyond the fact that the broadcast essentially acted all night long as an advertisement for the Ford Center and for the Dallas Cowboys organization, the Fort Worth Star-Telegram notes that Jones made bank while acting as the fight’s promoter, having drawn a crowd of 12,604 to the building when he just needed 9,000 people to buy tickets in order for him to break even. No wonder Jones was all smiles when he joined Spence in the ring for his post-fight interview — he’d made bank on the night. So too did Spence: Beyond his guaranteed $1.2 million purse, the fighter seemed pleased with his merchandise sales on the night, calling the whole night “a dream.” In other words, it won’t be a surprise at all if we see more of this Jones-Spence collaboration down the road. In fact, it seems likely: After the fight, Spence said he now hopes to fight annually at The Star. • The Dallas Cowboys had their fingerprints all over this thing. Seriously, it’s like Showtime was working for the Cowboys on this night given how much their promotional clips centered around Spence’s love for the team. Someone up in Frisco deserves a raise. And Don King should eat his heart out. 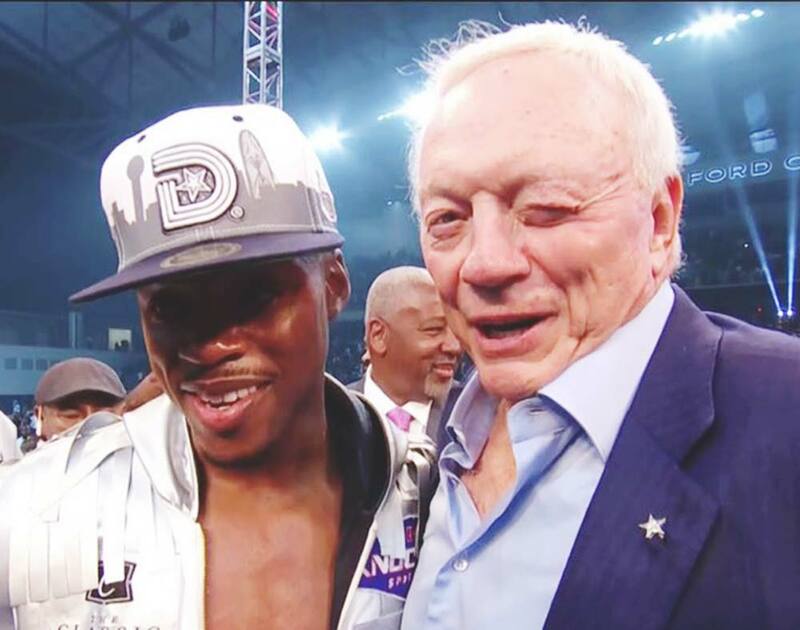 • Spence even wore a Triple D hat on the way to the ring and in his post-fight interviews. The fairly iconic hat made by the Dallas brand Triple D Gear features a close approximation of the City of Dallas logo. No one paying even the remotest amount of attention is surprised by this, but it’s a look that’s been fully embraced by Dallas hip-hop culture in recent years. The snapback version Spence wore on Saturday is (again) in Cowboys colors and also features the Dallas skyline. It goes for $35 right here. • The big-name celebrities at the fight were all Dallas-tied. When fights happen in Las Vegas, the celebrities shown on camera tend to be from Los Angeles. When a fight takes place in Atlantic City, New Yorkers dominate the close-ups. Up in Frisco, where ringside seats were going for $700 a pop, the celebs in the building were all from Dallas. The Cowboys (as one might expect, given the above) had a huge presence, with team owner Jones, Hall of Fame wide receiver Michael Irvin, current face of the franchise Dak Prescott and freshly paid sack machine DeMarcus Lawrence all in the building. Also there? The Bachelorette‘s Rachel Lindsay. (But, hey, let’s get Jamie Foxx, Selena Gomez and George W. Bush up in there next time, yeah?) But none of those compare to the coolest celebrity cameo of the night. • Yella Beezy, the hottest rapper in Dallas right now, walked Spence to the ring while performing his hit song, “That’s On Me.” That Yella Beezy would be joining Spence on his walk to the ring might’ve been been reported in advance of Saturday, but that didn’t make the moment feel any less triumphant as it happened. It was just damn cool to see: With the Dallas hip-hop scene currently experiencing its biggest year in a decade, seeing Yella Beezy and Spence walk to the ring together, the former performing a current Billboard R&B/Hip-Hop Airplay top 50 hit (not to mention local street anthem) as they did? It read like a “We’ve Made It!” moment both in the venue and on Twitter. The best part? As it happened, Spence — long a Yella Beezy supporter — looked like he was just as stoked by the moment as anyone else. Your chest filled with civic pride yet? Well, it should be — even if, as noted above, Spence says it’ll happen again. At this point, the details surrounding Spence’s next fight is unknown. Given how little damage he took against Ocampo, he says he’d like to be back in the ring again by the end of this calendar year. The real undetermined variable is whether he’ll fight Jessie Vargas, injured WBA welterweight champ Keith Thurman or WBO title holder Terence Crawford (who was not impressed by what he saw on Saturday). It’s also possible he’ll just wait until next year to fight the winner of Shawn Porter and Danny Garcia’s August WBC title bout. Eventually, though, expect Spence to make good on his promise to come back and fight again in the Dallas area, as hometown love has long been part of his message. Still, ain’t no time like the first time. And the love Spence showed for Dallas on Saturday night was dope as hell. Previous ArticleThings To Do In Dallas On Monday, June 18. Next ArticleScratch Session Promises A History Lesson This Summer.